The eighties weren’t kind to many of the superstars from the previous two decades. Making the transition from “musician” to “performer” in the MTV era proved difficult for the stand there and play your instruments crowd. Jefferson Starship’s Paul Kantner and Grace Slick looked like your parents on Halloween in the video for 1981’s “Find Your Way Back,” for example, and did anybody really need to see Crosby, Stills & Nash? Even KISS, the most visually interesting band of the ’70s, took off their makeup in the ’80s. The old-timers just weren’t made for these times, to paraphrase old-timer Brian Wilson. And then there’s David Bowie. If anyone was made for the multimedia ’80s it was Bowie. 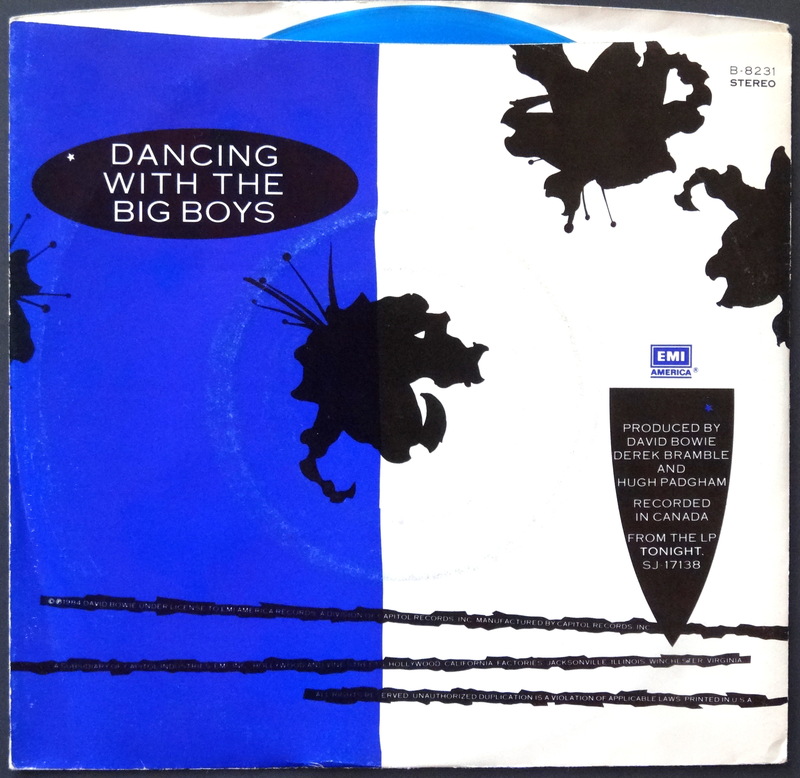 Let’s Dance, released in 1983, saw the former Thin White Duke/Halloween Jack/Ziggy Stardust reinvent himself again for the new decade. With his Jiffy Pop hair and his pastel suits, the former Aladdin Sane experienced the greatest commercial success of his career, which of course led to immense pressure to keep the cash cow alive. Which brings us to 1984’s Tonight. Bowie’s goal was to retain the new fans he’d earned courtesy of Let’s Dance, and perhaps more importantly during that album’s “Serious Moonlight” tour. It was during that mega-tour that he worked on demos for what became Tonight, and the lack of time and attention showed. While the album received a mostly deserved critical drubbing it sold well, and in retrospect it’s nowhere near as bad as his creative nadir, 1987’s Never Let Me Down. 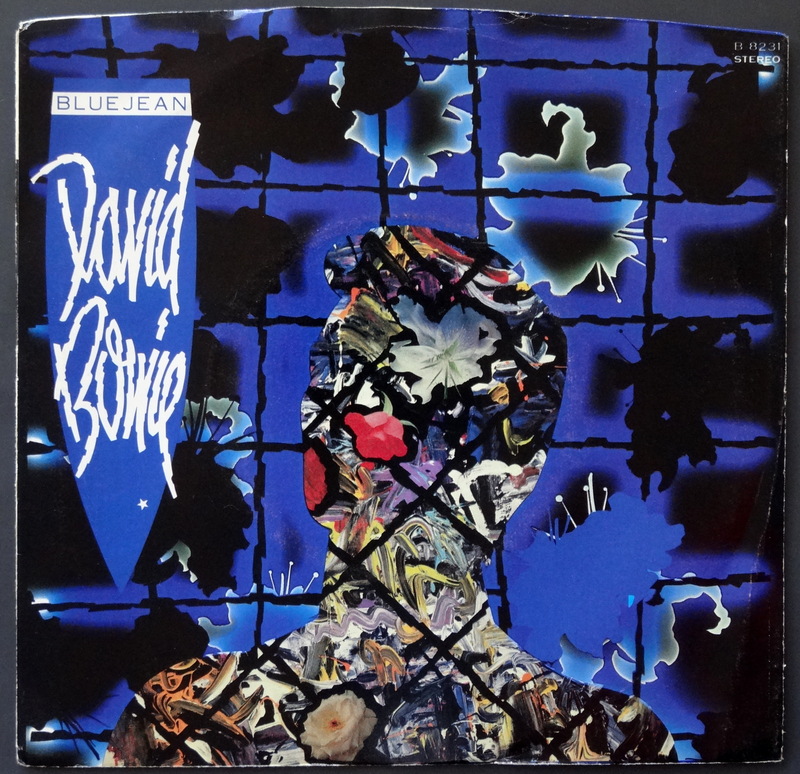 Album opener “Loving the Alien” is canonical Bowie, his cover of the aforementioned Brian Wilson’s “God Only Knows” is sufficiently weird, and lead single “Blue Jean” holds up as what it is: a sugary pop confection. But for our purposes today, what matters is “Blue Jean’s” packaging; after all, a 45 no longer serves a practical purpose. I can stream the song whenever I want–no need to fire up the turntable, clean the record, and carefully drop the needle. No, when it comes to the stacks, the thing is the thing, and this particular single is one beautiful thing. Start with that picture sleeve, a variation on Tonight’s album cover, which is itself a play on Gilbert and George’s “Faith Curse.” That in itself is enough to earn a place in any Bowiephile’s collection, but inside the sleeve is the real prize. 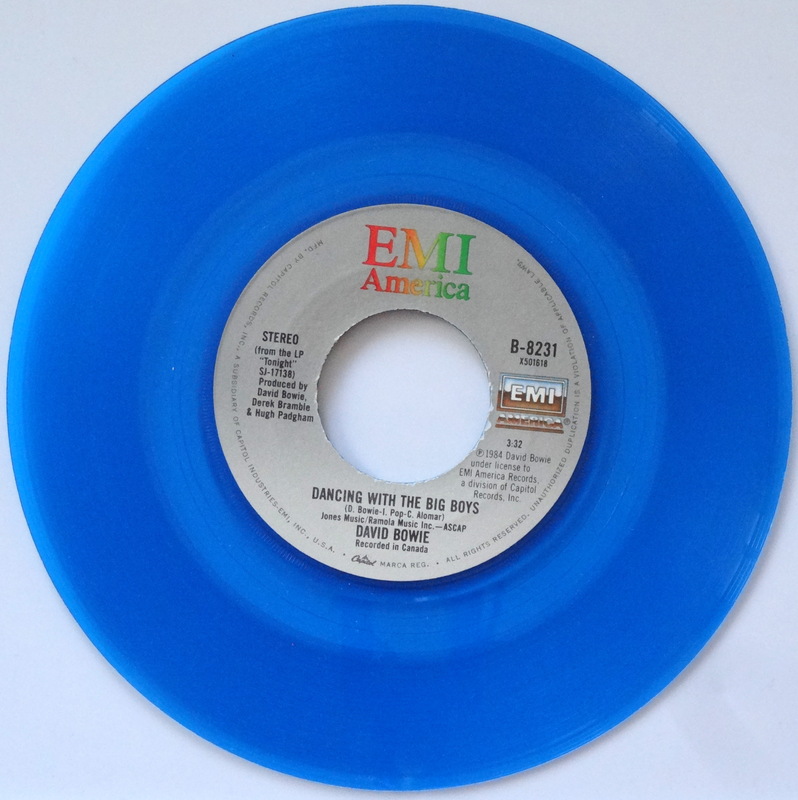 Just look at that blue vinyl–how could I pass that up? My teen years were spent jazzin’ for colored vinyl, and a blue “Blue Jean” was just too perfect. It was all part of a brilliant multimedia presentation (or marketing campaign, I guess, if you’re feeling cynical) that claimed as its crown jewel the Grammy winning short film “Jazzin’ For Blue Jean,” directed by Julian Temple. Even more so than the videos from Let’s Dance — or from Lodger or Scary Monsters, for that matter– “Blue Jean” proved that David Bowie wasn’t just another ’70s dinosaur who couldn’t adapt to the MTV ’80s. Ironically, it also represents his last great commercial success. Critical success would return a decade later with Outside, at which time he settled into a sort of elder statesmanship that he enjoyed throughout his last quarter century. Want a blue vinyl “Blue Jean” for your own stacks? Expect to pay 5 to 15 bucks, so let’s call a tenner a fair price. Happy hunting. I still have mine! Snap! Snap! Snap! So we’ve accounted for two. Now we just have to account for the other 999,998 that were sold….